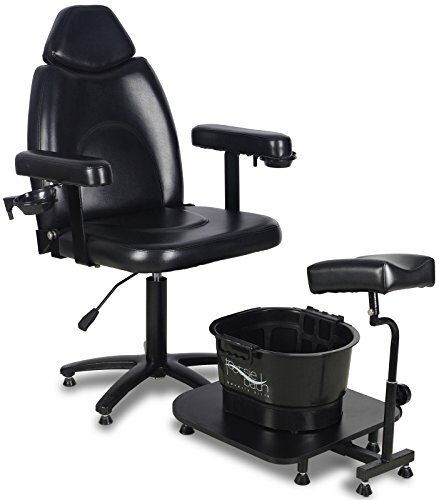 The "Zenith" is the kind of chair that makes basic functionality feel like upscale treatment. The chair has PVC vinyl upholstery wrapped around dense padding on the seat, back, and armrest. It's also built for your utmost convenience with manicure bowls attached to each arm, a table for foot baths, and an upholstered leg rest. Every section is adjustable so you can raise them to accommodate different leg lengths, and the chair is on a hydraulic base that can raise and lower 5 inches. This pedicure chair understands that the fancy designs are your department; it's just there to support you. NOTE: Footsie Bath is not included. Height: 41" - 46.5" x Width: 18.5" x Length: 52", Arm to Arm: 20.5"
If you have any questions about this product by Icarus, contact us by completing and submitting the form below. If you are looking for a specif part number, please include it with your message.